The Sacred Rock is a monolith of amazing dimensions arriving to have a height of 3 meters seated in a base of 7 meters of width within a rectangular perimeter with two adjacent chambers called huayranas, which present the peculiarity of possessing only three walls. Its shape reminds us of the profile of a feline on a carved granite podium, it was built with tools called as the city of Ollantaytambo (rocky pebbles). Anthropology experts have interpreted this feline base as the representation of the puma (sacred animal in the Inca civilization) on the Pumasillo hill in Machu Picchu, from which the theory that both the Sacred Rock and the others Buildings of the Main Square, represent the geographical location of the various geophysical elements of the mountain systems of the surroundings of Machu Picchu and Huayna Picchu. The Sacred Rock is located at the center of two huayranas located one in front of the other, separated by a high ceiling patio, it is worth to clarify that the callancas were sheds that served to lodge the people that would witness some religious ceremony. Apparently, this rock would be an altar, a central and important element in an area of worship, destined for the worship of the Apu”Yanantin“, not only the Inca Civilization would have a high knowledge of the cosmos, because for the cultures that have it Before, cosmology was a conception of the world, where all beings lived. The Incas worshiped the mountains, which acted as tutelary gods (Apus). Today, the Andean man continues with this conception coming from his ancestors, whose purpose is to live in harmony with Mother Earth (Pachamama), which is why he continues to perform rituals, offering his Apus, their respect and veneration. The meaning of such an important piece for the Inca civilization lies in its location in the Inca City of Machu Picchu, which in turn lies to the east of the depression formed by the mountainous systems Machu Picchu and Huayna Picchu with the Central Andes south of Country, on the eastern slope of the Vilcanota mountain range. The experts have outlined several theories about the meaning of the Sacred Rock and one of them has centered its hypothesis, since it can be seen of Cerro Pumasillo, located in the posterior face of the valley, view that has some similarity with the form in the That the Holy Rock was carved; Therefore, this theory affirms that the Sacred Rock represents a kind of model of Cerro Pumasillo, and a usefulness that could well have been the study of the cosmos, carried out by the practice of sacred rituals. 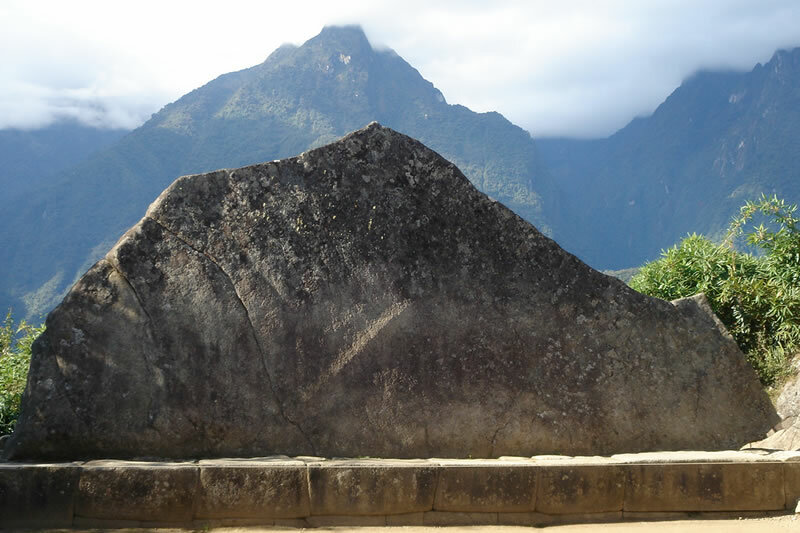 It is important to emphasize the importance of the area where the Sacred Rock is located, an area that represented one of the most relevant areas of the city for the Inca civilization. The Sacred Rock also seems to possess a geographic purpose according to the studies made on the area, the location of the Sacred Rock coincides exactly with the northern part of the city, a location that also houses, the step that leads to the interior of the mountain Huayna Picchu, Which gradually becomes a rather narrow path, which goes into the mountain. The road also offers a kind of shortcut to the urban area where the main square of the city is located, both reasons, have made the experts strongly support the idea that the Holy Rock represents a geographical landmark that demarcated the location of the portal of Pass from Machu Picchu to the Huayna Picchu.